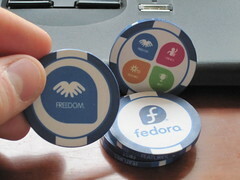 I’ve been using Red Hat flavors of Linux since 1996 (with a brief flirtation with Slackware in 1995), and I’ve been married to the offspring Fedora distribution since early 2004. I’ve been tempted to stray to some other distro, but I’m just not adventuresome that way. In theory, some major malfeature could make me file for divorce, but that hasn’t happened yet. Bottom line: no matter how knowledgeable you are, an OS upgrade is good time to wear both suspenders and a belt. If you have a working environment with precious data, you’ll want to be able to fall back to it if things go wrong. But things didn’t go wrong in my case. So yay. The Fedora 19 installer is not much changed from the Fedora 18 installer. Which at least one guy found to be “counter-intuitive, dangerous and useless, all at the same time.” But once I figured out what the deal was, I thought it was OK.
I’d switched to Xfce after hitting and bouncing off Gnome 3, which became the default with Fedora 15. What an awful decision for the Fedora honchos to make! And it didn’t help that the Gnome developers came off as snooty and unsympathetic; if we puny users could not appreciate their brilliant design, it was our fault. True fact: Googling gnome arrogance brings up 2.7 million hits, and they’re not all talking about the garden statues. I understand Gnome may have gotten better since then. Don’t care. Fortunately, you can easily choose which environment to install. And you can have multiple environments installed if you want to compare and contrast. As stated, the work machine was a spankin’ new virtual machine; the only tricky part was setting it up to use a different IP address than the Windows host; VMWare makes this pretty easy, although you have to remember where it is and when you have to do it. The minor tricky part: getting all the necessary Perl modules back. I didn’t want to mindlessly re-install everything I had before, since that might well contain some unused cruft built up over the last few months with Fedora 18. I settled for an incremental approach (wait for things to break, then fix them). I really should come up with a better method the next time around.